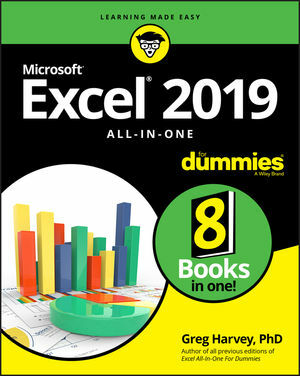 Excel 2019 All-In-One For Dummies offers eight books in one!! It is completely updated to reflect the major changes Microsoft is making to Office with the 2019 release. From basic Excel functions, such as creating and editing worksheets, to sharing and reviewing worksheets, to editing macros with Visual Basic, it provides you with a broad scope of the most common Excel applications and functions—including formatting worksheets, setting up formulas, protecting worksheets, importing data, charting data, and performing statistical functions. If you’re a new or inexperienced user looking to spend more time on your projects than trying to figure out how to make Excel work for you, this all-encompassing book makes it easy!